New 10 rupee note RBI introduces The Reserve Bank of India (RBI) has come out with a new design chocolate brown ten rupee note. The new note will have the same height of 63mm as the current ten rupee note but the width will be 123mm - slightly lesser than the 137mm width of the existing note. Besides the colour and the size, another main difference is that the reverse of the note will carry a motif of the Konark Sun Temple. The existing ten rupee note carries the image of fauna of India - rhinoceros, elephant and tiger. The RBI said that it will shortly be putting out the new note into circulation bearing signature of governor Urjit Patel. The note has other designs, geometric patterns aligning with the overall colour scheme, both at the obverse and reverse. Existing banknotes in the denomination of Rs 10 issued by the RBI in the earlier series will continue to be legal tender. As per various news reports, the central bank has already minted around 1 billion pieces of the new Rs 10 note. The existing Rs 10 note had a design change in 2005. It currently has a picture of Mahatma Gandhi on the front side while a combo picture of an elephant, a tiger and a rhinoceros is printed on the backside. 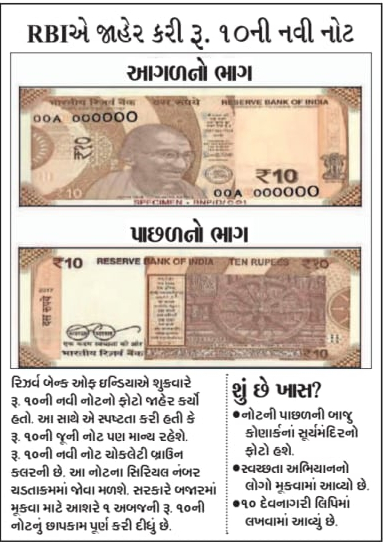 The new note may also receive a makeover in its numbering pattern as seen in the new notes. In the new notes, ascending size of numerals can be seen ..
Other features of the new not include, a see-through register with denominational numeral 10, Denominational numeral 10 in Devnagari script, portrait of Mahatma Gandhi at the centre, The new note will continue to have windowed demetalised security thread with inscriptions 'Bharat (in devnagri ).